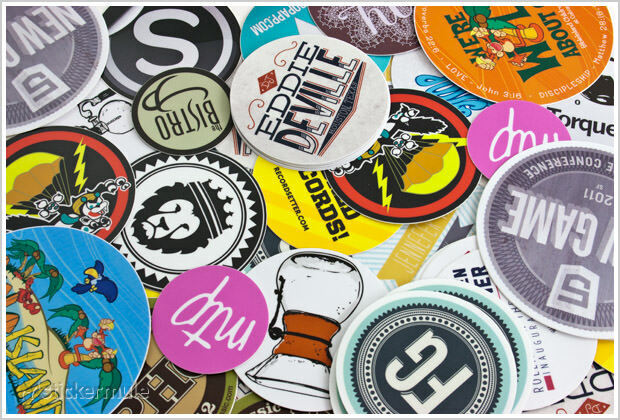 A sticker is a type of a piece of paper or plastic, adhesive, sticky on one side, and usually with a design on the other. They can be used for decoration, depending on the situation. They can come in many different shapes, sizes and colours and are put on things such as lunchboxes, in children's rooms, on paper, lockers, notebooks and so on. Some people collect and trade stickers with other collectors. Temporary name tags are usually stickers. They are frequently distributed as part of promotional, advertising, and political campaigns; for example, in many voting districts in the U.S., stickers indicating an individual has voted are given to each voter as they leave the polling place, largely as a reminder to others to vote. Observers may clap hands, honk a horn or otherwise applaud a good sticker. Stickers are also used for embellishing scrapbooking pages. Kinds of stickers sold for this purpose include acrylic, 3D, cardstock, epoxy, fabric, flocked, sparkly, paper, puffy, and vellum. While in the earlier days of scrapbooking stickers were sold mostly on 2"x6" sheets, now 6"x12" and even 12"x12" size sheets are very common. Stickers applied to guitars are called guitar decals. Post-it notes are stickers having glue on only part of the back, and are usually sold blank.